My posts on the launch have been a touch hiccoughy – so here’s a little recap ‘cos I know there’s a lot of interest out there. 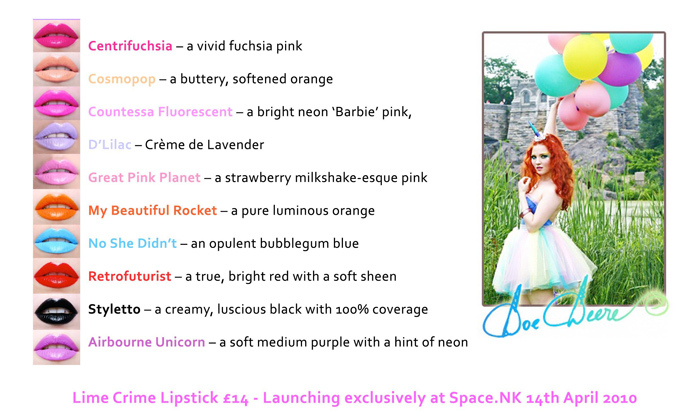 Fully launched now, you should be able to find the Lime Crime lipsticks in your local store…. if you do go and have a play with some of the colours, please come back and share your thoughts with me (and everyone else!). It would be great to get lots of varied feedback because judging by some emails I’ve received… I’m beginning to get the impression that some of you are really interested and excited by the lipsticks but hesitant to display your excitement for fear of ‘going against the tide of opinion’. Getting excited about super-bright lipsticks is your prerogative and we should all be excited about beautiful colours and new launches! The majority of you who come here aren’t beauty bloggers and don’t leave me comments and are infact interested in one thing and one thing only: “…are they any good ‘cos I don’t wanna waste £14 on a crappy lipstick”. I say… read my review and then go and try a few shades! While you’re at it, please come back and let me know what Airborne Unicorn is like ‘cos my nearest Space NK is a shocking 25 miles away. Yep… feel for me. And that (you’ll be pleased to hear) is probably my last word on it. I hate them. I find the quality appaling for the price.. a few have an ok texture but a few like Cosmo pop sit on your lips like streaky paint. Thick, drying, dont spread well (especially not on the inner middle part of the lip) Nothing at all nice about any of the ‘more out there’ colors..they seem to have the worst consistencies. I found them to also be NOTHING like the online swatches. Very dissappointing.. so dissappointing Im not even going to waste my time blogging about them. Lol.. et voila my oppinion!! Hope your well hon! I dont like them at all. Not swatched them and have no intention to swatch them. Bright colours are just not my thing, unless its on my nails ha. I could not imagine putting such bold colours on my lips and being able to pull it off. Gareth would probably just laugh! Is your nearest Bournemouth? It’s a great store, and not too far from you? I go to Southampton Uni. Hoping they’ll be there next week! I’m interested to try the one that you said was good, the orange one. maybe you should feature good dupes for these since these are awfully expensive and majority of them are said to be chalky. I sooo wish I was interested in these. Space NK is literally a 1 minute walk from my office. Somehow I can’t imagine anyone in the city wearing them though!! @Georgie, yep – Bournemouth’s Space NK is indeed a rather lovely store… I could (and do) spend hours in there! Razorpit – Prolong the life of your razors? !